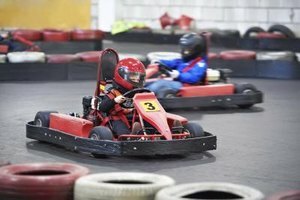 You don’t have to have any experience to try your hand at racing a kart at an indoor kart track. It’s just a case of turning up with your friends or family, paying your money and giving it a go! The karts used are low powered, so no matter what your driving experience, the risk to your safety is minimal. Procedures are put in place and the safety of the customer is paramount, so don’t feel that you will be taking the same risks that a professional racing driver does. This is purely for recreational purposes. Indoor racing tracks, on the whole, have less grip, allowing you to slide around corners. Although this slows you down in the long run, it is a whole bunch of fun, which is what this type of karting experience is all about. These types of low powered karts have no gears, either manual or automatic. You never build up enough speed to need to change up a gear. If you want to give go karting a try, this is where you should start out. As above, but with an asphalt track, meaning that your kart will have more grip with the surface resulting in a faster experience. The outdoor tracks of this variety tend to be larger in size to accommodate the faster speeds, although the karts tend to be of the same standard. It is advisable to try your hand at an indoor track before venturing outdoors, but not mandatory. It’s all down to your confidence as a driver really. This is where things start to get a bit more serious and expensive. This level of karting shouldn’t be considered until you have cut your teeth for a number of months at a day kart track and shown that you have the aptitude to progress to the next level. It certainly isn’t for everybody. The risk of accident and injury increases, and it takes a huge amount of commitment and self-sacrifice to make the investment involved at competing at this level worthwhile. Racing at this level is normally done on larger racing tracks that are also used for other forms of motorsport. This is to accommodate the higher speeds that karts of this variety can achieve, often upwards of 100mph, with engine sizes from 100cc up to 250cc. It is in this arena that the professional racing drivers of the future are born and it is not for the feint of heart. There is a great deal of fun and satisfaction to be had in this form of karting. But it is a long-term, serious commitment. If you are interested in taking up this level of kart racing, you’ll obviously need a kart. To make things affordable and keep costs down it is advisable to buy a second hand used kart while you are just starting out. You can always upgrade at a later date. Anyway folks, that is enough for today. Be sure to get out and give karting a go if you get chance. Until next time!